The Chinese Lady is a shattering story of how our western culture’s scopophilia leads us to make “freaks” of those who are different to ourselves. Our obsessive voyeurism does not lead to understanding of others but rather a desire to possess, command and sometimes destroy the objects of our incessant gaze. This is one of the most original, thought-provoking and necessary works I have ever seen. It is a production that excels on every single level – text, direction, performance and design. I am still haunted by the brilliance of the insights, the emotionality unleashed in the spaces between words and the visual sumptuousness of it’s execution. In this mighty text, Lloyd Suh lays bare humanity’s darkest side with a grace that is utterly disarming. He hypnotizes us with wonders of the “other” and we feel our curiosity peaked. Then he slowly scratches away at our ways of seeing so we are forced to look inward. All of this done in a gentle, meditative and extremely humorous way. The Chines Lady is based on a true story where Hong Wang-Tzang Tzee King gave his daughter, Julia Foochee Ching-Chang King to Capt. Obear to be placed on exhibition in New York, for 25 cents, so that visitors could see the first ever Chinese woman in America. The year is 1834. Her name was shortened to Afong Moy and she had an interpreter, Atung, who would translate her answers to the visitor’s questions. The Carnes were importers of Chinese goods and had “procured” her to possibly advertise their wares they were selling from the Orient. She was placed in situ amongst these ornamentations where the audience could see her tiny feet –the result of the ancient practice of footbinding. This is the starting point for Suh’s masterpiece. It is a biting discourse on “othering”, immigration, colonization and cultural appropriation. These are heavy topics but in Suh’s hands they are given an original frame that allows for a deeper understanding of the human suffering that is the bi-product of the west’s narcissism and cultural voyeurism. We follow the lifetime of Afong Moy and Atung as they are trotted out as curiosities in a cultural “freak” show. Afong Moy sees her mission as a noble one – spreading mutual understanding between the East and the West. Every day she performs her ritual of “twaddling” about on her small feet, eating with chopsticks and explaining Chinese tea ceremonies. Every repetition of the exhibition visit yields more information on her past and present realities. We start to see the “cracks” in the walls as history peaks through. Her life passes before our eyes as she remains a “captive” in the “exotic” room –forever on exhibition treading water. Atung is the interpreter supposedly “irrelevant” but who is ultimately the narrator of the time. His translations are what we “hear”. He tells us the story he wants and needs us to hear. The burden of the interpreter is explored so cleverly in this piece as he “speaks” for Afong and decides the perspective of the story we are witnessing. Director Ralph B. Peña is a genius. He gives us a tight, expertly woven Chinese knot full of auspicious wishes for a future where difference is not demonized. You can see his steady hand in every crafted and highly detailed moment. His clear vision is intoxicating and he creates a compelling journey that you ecstatically follow. Shannon Tyo as Afong Moy is simply astonishing. She commands the stage with a vibrant authenticity. It is like watching a silk wall hanging come to life. Tyo gives an elegant, well crafted performance beguiling you with her mesmerizing physicality, expressive gestures and powerful presence. It’s an intensely moving characterization. Daniel K. Isaac as Atung embodies the anguish of the servant, the slave, the unrequited with a sensitivity that leaves you holding your breath. He is like water moving with the tide of Afong Moy. He dances around her, for her but never with her. Isaac has a way of making the audience feel safe and nurtured, you trust Atung…and then he slowly pulls the rug out from under you with a gentle tug of honesty. It’s a spellbinding performance full of empathy and agony. The set and costume design is epic. The opening moment of the play made me audibly gasp. Junghyun Georgia Lee has created an entire world in a box. It is so beautiful to see and it feels like a living, breathing character that also has its own journey of loss as history breaks it down, stripping it of it’s inherent exquisiteness. The set is an exceptional artwork that housed the production in its vivid frame. Oliver Watson’s lighting design shone light into the crevices of our dark past revealing and highlighting the moments we should not forget. It felt like the lighting was attempting to cleanse the horror of this past while shining a spotlight on our current dark challenges. I liked following the light as it too had a story to tell. Fabian Obispo’s compositions and sound design rattled my solar plexus and snake charmed big emotions out of me. It is a rousing, impressive score that is the glorious current on which Atung and Afong Moy sail past. I went to this production with two loved ones and it has been a constant presence in our conversations since we saw it. We were all fundamentally shifted by this work. This is no chinoiserie, it is not an imitation or evocation of a long forgotten Chinese motif – it speaks to us right here in 2018, it’s a warning, a prodding, an invitation to look closer. There are only a few shows left of this defining work – give yourself this gift (and all of your family, friends…even enemies). 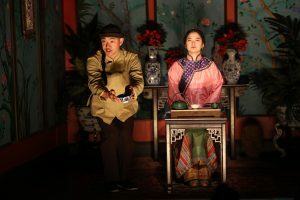 This jewel comes to NYC thanks to the Ma-Yi Theater Company who present productions of superior quality which are relevant, honest, enduring and up-lifting. Thank you!